We performed this Audit in response to concerns from the Departments of Finance and Law regarding pension payments to two deceased pensioners' accounts. The concerns followed the discovery of $75,690 diverted by a former Pension Division employee in the names of deceased and fictitious pensioners. 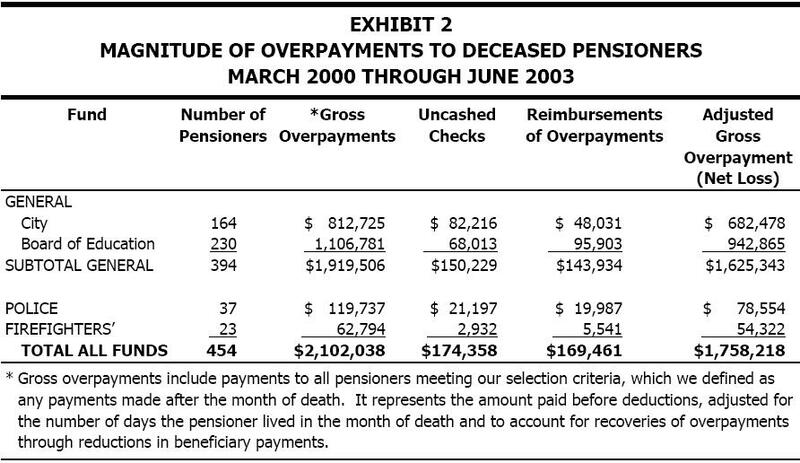 The Pension Division made payments totaling $2.1 million from March 2000 through June 2003 to 454 pensioners identified by our data sources as deceased. The pension overpayments and fraud occurred as a result of inadequate policies and procedures for monitoring pension payments. Establish policies and procedures to collect pension overpayments made to deceased pensioners. Develop a more proactive process for identifying deceased pensioners. Segregate duties so employees generally have access to only one major job junction within the software used to track pensioners. Improve supervision and review of the work of subordinates.